Features You May Have Missed! Klipboard has a great deal of features and there may be some that you have missed. The article below lists some of the more commonly missed key functionality. 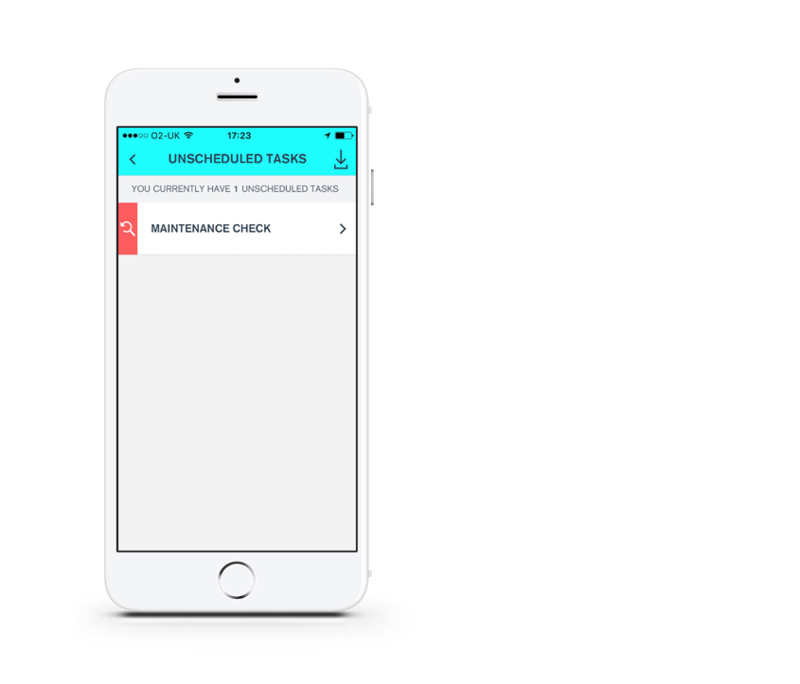 Task reassign allows you to send the task back to the user with notes if required. The user will receive the task again on their Klipboard iPhone/iPad or Android app account. The reassigned task will be highlighted red and will contain all the original data captured initially, so if edits are required they can take place. 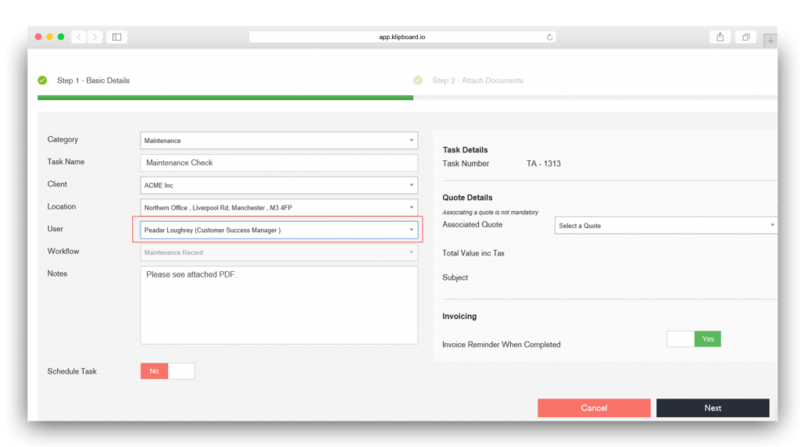 Typically the reassign feature is used to send the task back to the user with the task notes section used to direct the engineer to correct mistakes or complete missed data fields. In some use cases, the reassign feature is used to send the task to another user where they can add their own comments as part of the job. On the user’s device a reassigned task will be highlighted in red and will contain all the previously recorded data. The user will then run through the task as normal completing all their required information. If you require more detailed overview of a particular client you can access the Task Status option within a client. This will give you a customizable overview of all task progress for that particular client – for more information please see this blog. Tasks include a map of the client location which can be used to give the user the exact GPS location of the job. 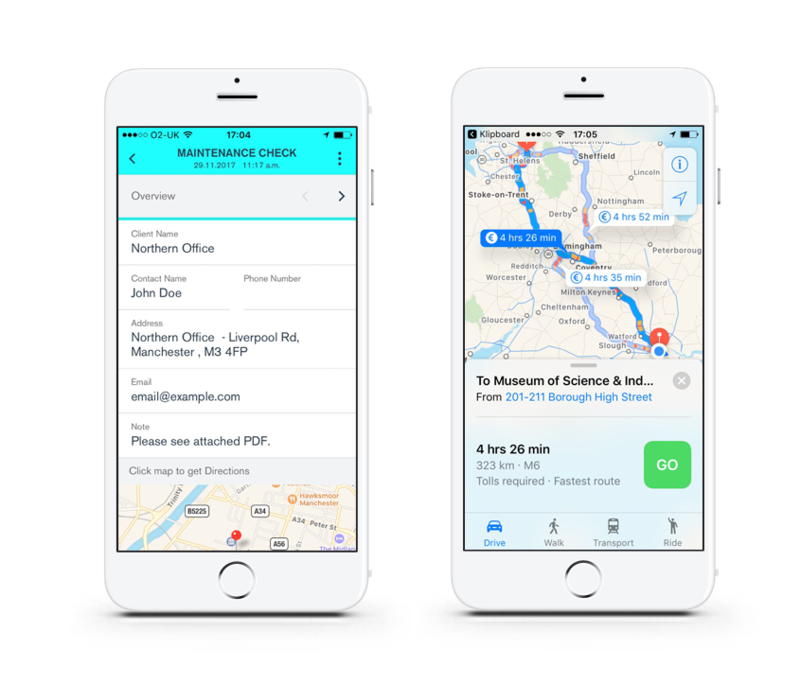 We leverage the best in class GPS location technology with our iPhone/iPad app being powered by Apple Maps and the Android app running on Google Maps. When you open the task details you will have the option to view the location within the map at the bottom of the screen by selecting the map. This will open the map where you will be able to view the exact route details. 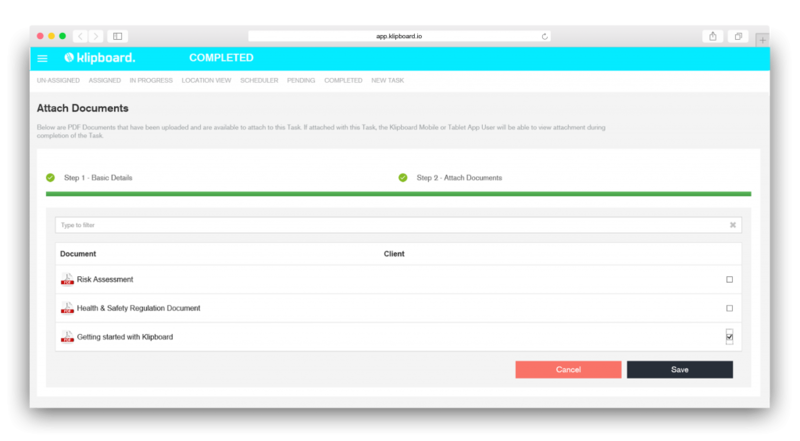 When creating a task you have the option to attach PDF documents which you have uploaded into Klipboard via the Documents section in the Web Dashboard. These PDF attachments are accessible at anytime when the task is opened on the device through the side bar menu which is accessed on the top right of the screen via the three dots. The user simply selects the respective PDF to view. The PDF attachments are used to give additional instruction or insight for the job to be carried out. You can upload as many PDF documents to Klipboard and attached as many documents you need to a task. An individual PDF document can not exceed 10MB in size. 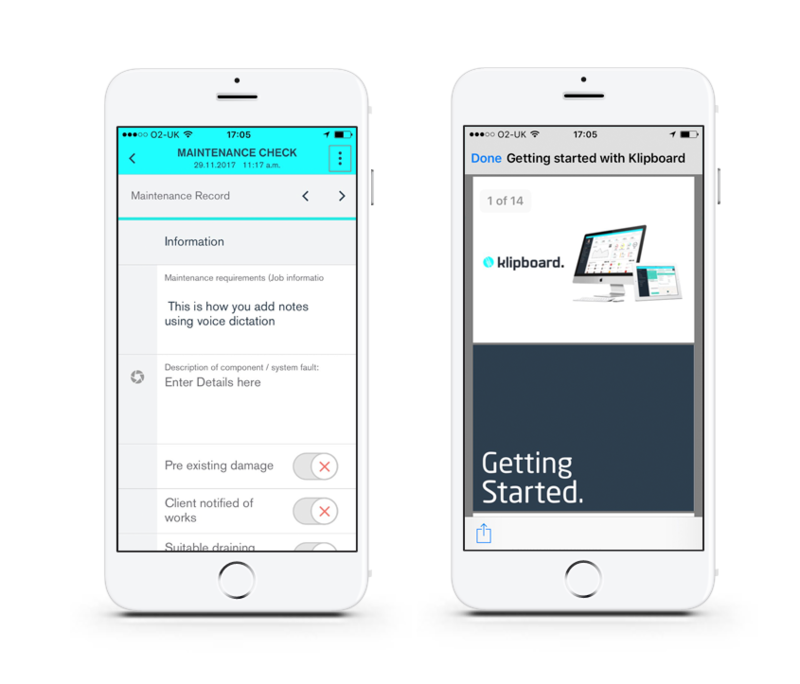 To save yourself some time out on site you have the option to use your device voice dictation software to verbalise your notes instead of manually typing in your notes. Our tablet and phone apps utilize the particular device software; (iPhone/iPad – ‘Siri’ and Android – ‘Google Voice’), enabling you to have a further choice of how to add your data. Please note, to use your device’s voice dictation software you must be connected to the internet. 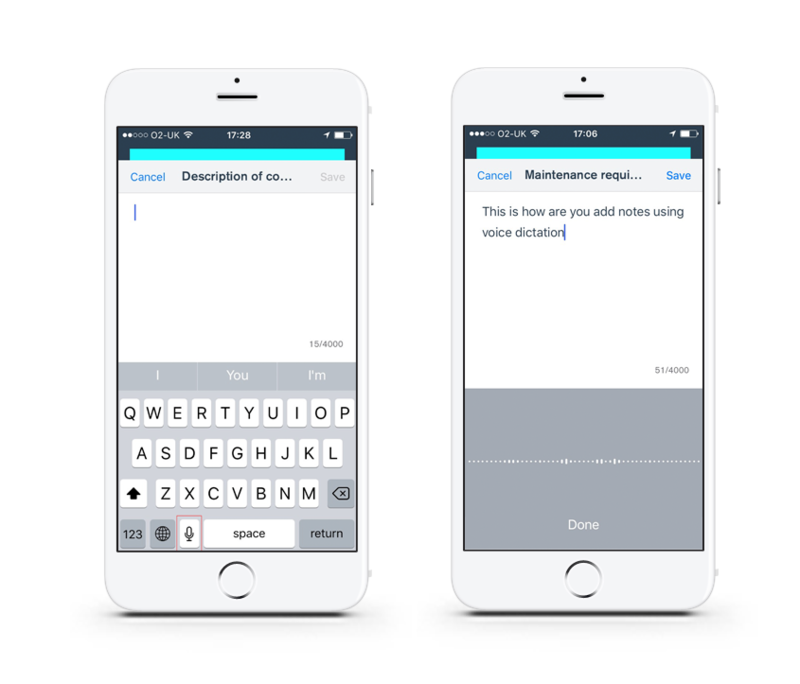 On the device keyboard, simply select the microphone icon and dictate your notes. Once done, select save.